The goal of this volume is to provide an entry point into this exciting and challenging field. It is directed, on the one hand, at graduate students and professional mathematicians who would like to work in the area. The longer articles in particular represent an attempt to enable a reader to master some of the more difficult techniques. On the other hand, the book will also be useful to mathematicians who would like simply to understand something of the subject. They will be able to consult the expository portions of the various articles. This book is suitable for independent study. 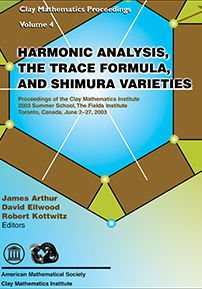 Graduate students and research mathematicians interested in number theory, automorphic forms, and group representations.